I am always on the lookout for quick and easy meals that can easily be prepared after a long day at work. I recently bought a box of chicken breasts that for some reason just didn’t seem to be of the highest quality. I decided to pre-boil the breasts and then use the cooked chicken for easy meal preparation. I found this Chicken Enchilada recipe on All Recipes. It had high ratings and looked super simple to prepare. 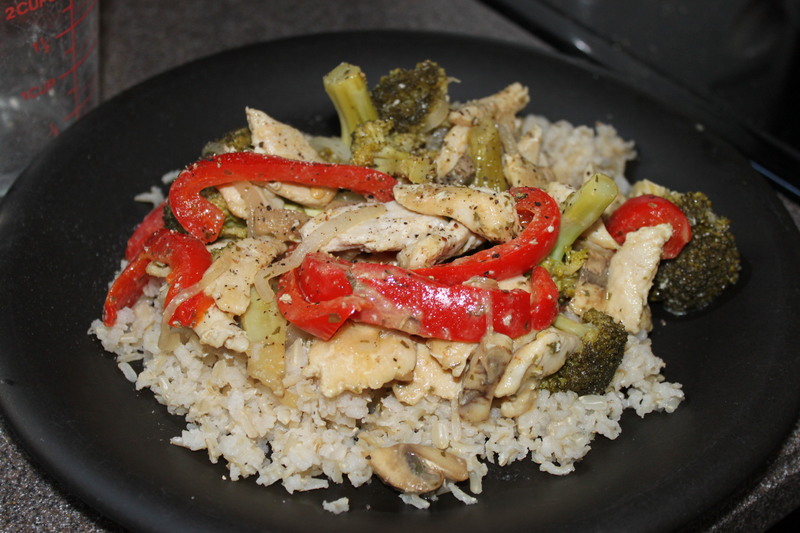 I was able to whip it up in about 15 minutes with the chicken having been pre-cooked. I can’t say this is anything fancy, but I give it a 5 STAR rating. It got rave reviews from the whole family which is not an easy feat and was super easy to make. The flavour was great and I made do with the ingredients I had on hand, which meant that I did make a few modifications to the original recipe. Preheat oven to 350 degrees F. Use cooking spray to lightly grease a large baking dish. Melt the butter in a medium saucepan over medium heat. Add the green onions and sauté until tender. Add the garlic powder, and then stir in the green chiles (or broiled jalapenos), cream of mushroom soup and sour cream. Mix well. Set aside approximately 3/4 of the sauce. Add the chicken and 1/2 cup of shredded cheddar cheese to the remaining 1/4 of the sauce in the saucepan. Stir to mix. In a small bowl, combine the reserved sauce with the milk. Spoon this mixture over the rolled tortillas and top with the remaining 1/2 cup of shredded Cheddar cheese. Bake in the preheated oven for 30 to 35 minutes, or until cheese is bubbly. The original recipe calls for 6 tortillas and suggests that it serves 6. I found the filling was more suitable for 4 tortillas, but we were all left wishing there were more. I would suggest doubling the recipe or sticking to a single recipe and serving the enchiladas with soup or salad for a more complete meal. We were having friends over for dinner on the 27th and I was really having a hard time deciding what to serve. At this time of the year, everyone feels like they’ve been eating way too much and are literally craving something light. So, it was initially my intention to serve a delicious, but light dinner so that everyone could feel satisfied without having to adjust another notch on their belt. When I decided to serve fish, I figured it would be a nice light alternative to all of the festive meals, snacks and treats that we all tend to indulge in over the holidays. However, as I began to scour my own recipes and search for some new ones, I found some great Italian recipes that I just had to try. Although the meal was not the light meal I originally intended, I did try to balance our the rich and creamy seafood lasagna with a nice big salad and a side dish of mushrooms. It is always a bit of a risk trying something new for company and I figured I was pretty much “walking the plank” when I tried four brand new recipes at one dinner party. I did stick to a tried and true dessert, but everything else was a first and all of the recipes were keepers. The meal was great and nothing was too difficult to make. I must admit the pictures are not the best. Remember, we had company for dinner. No time to stage or adjust the lighting. In fact, I had to hide my frustration when my camera only allowed me a couple of shots before my memory card was full….thanks Eden!! Oh well, if you want to see fabulous pictures, you’ll have to visit the original sites that the recipes were found on. I’m not even going to bother typing out these recipes. I followed them pretty carefully because I was trying them all for the first time. Here are the links and I’ve added a few notes below outlining a few of the changes I made and tips for success. Roasted Mushroom Salad: I ended up using white, cremini and shiitaki mushrooms and omitted the portobello mushrooms that were suggested, but just as a matter of preference. Also, be sure to use trays with sides as the mushrooms will release juice as they roast and caramelize. I coated all of the mushrooms in oil and pepper at the same time in a large bowl, but separated them onto two sheets so that they had lots of room to roast. Mushrooms do not like to be crowded when they cook. I used two cans of crab meat instead of imitation crab in the Seafood Lasagna. I also wondered about adding a tablespoon or two of white wine to the sauce, but didn’t and it was lovely without. Be sure to allow time for the lasagna to “stand” before serving. Mine was a bit runny, but I could tell it would have been fine had I given it 5 more minutes to sit. The Big Italian Salad recipe doesn’t list green onions under the ingredients, but it was in the pictorial instructions, so don’t forget to add them in. The Chocolate Mousse Cake is a light and decadent dessert that never fails and is always delicious. I chose to make this cake because it is easy and you can make it a day or two before. I love that! Also, my son has been eating “gluten-free” for the last couple of months (just a trial) and there is no flour in this cake. I love that this flourless cake was a favourite long before the gluten-free experiment. It is a great option if you are trying to avoid wheat/grain. If you enjoy Italian and seafood, you are absolutely going to love this combination. The recipes blended wonderfully. Both the mushrooms and lasagna were absolutely scrumptious….and those biscuits. Mmmmm….delicious! I’m always on the hunt for new recipes to add to our weekly menu board. Our life seems to have gotten 10 times busier with Eden in grade 7. It seems like she has homework most evenings and weekends and although she is a good student, she didn’t really have any experience with homework, studying or project work from elementary school and the adjustment to managing the work load has been pretty huge for her. We are trying to support her and coach her through the changes, but it has been a very loooooong September. As the “homework cop”, I feel like I’m in grade 7 as well! We all love shrimp, but I really didn’t have a “recipe” that I followed when cooking it. I generally put it out for fondu nights, but rarely made a regular meal with it. I decided to look for a shrimp/pasta dish that would be both delicious and easy to prepare. I lucked out on the first one I found and I’ve already made it twice in the last two weeks. All I have to do is take the shrimp out of the freezer for the kids to be buzzing with excitement over the pending dinner. They love this and so do I ~ you can’t beat the 10 minute prep. time and I always have the ingredients on hand. All you have to do is keep of bag of shrimp in the freezer and you’re set to go! This recipe meets all of the criteria and is a new staple on our menu. This recipe was found on Food.com and was submitted by Jessica K. Thanks for sharing such a great recipe! Cook to “al dente”. Drain (reserving 1 cup of water) and set aside when done. While pasta is boiling, wash the shrimp. Melt 1/4 cup of butter over medium heat. Add shrimp. Cook 5-7 minutes and add oil. Continue to stir till shrimp is pink and curled. Add pasta and seasonings to the skillet. Add just enough saved pasta water to keep the pasta moist, but not swimming in liquid either. Depending on the amount of pasta this may only require 1/2 the cup or all of it. Start with adding 1/4 of it then work up from there. Keep tossing all ingredients around in skillet till all is incorporated and hot. Serve with red pepper flakes and freshly grated parmesan cheese. Enjoy! This pasta dish is very tasty and when served with a salad, makes a great meal! Nothing compliments a Greek salad more than a delicious gyro. I love this scrumptious chicken marinade. I was a bit disappointed when I asked my husband to pop the chicken on the BBQ/grill shortly before dinner and he informed me we were out of propane. Yikes! I ended up broiling them in the oven and they were still very good, but the grill would have been awesome….next time, I guess. I found this recipe on Cooking Classy and it both looked and sounded delicous. I generally follow a recipe closely the first time around and then “tweak” it, if necessary. This marinade recipe was quite different than any I had tried before and so I really didn’t change a thing. Now, after having made it once, I feel there is no need to. It was very good as is. Place the marinade ingredients in a bowl. Whisk to blend. Place chicken in a ziploc bag. Pour marinade over the chicken and seal the bag while pressing out excess air. Transfer to the refrigerator and marinate for 2 to 4 hours. Remove the bag from the fridge 30 minutes before grilling. Allow to rest at room temperature (in marinade) for the last 30 minutes of marinating time. Brush the grill grates lightly with oil and preheat the grill over a moderately high heat. Once hot, add chicken and grill until cooked through (165 degrees). Rotate once half way through cooking. Remove from the BBQ and transfer to a plate. Brush the chicken lightly with olive oil and then cover with foil. Allow to rest for 10 minutes before slicing into strips. Assemble the gyros by laying chicken across the centre of a flatbread and then layering the toppings. Wrap it up and serve. You can serve it with extra Tzatziki sauce, if you wish. I have to admit, by the time dinner was ready we were in a mad scramble to pick-up Eden from volleyball practise and get Shay to his hockey try-outs. I can’t wait to make these gyros again, on a day when we can slow down and enjoy them in a fashion that doesn’t cause me indigestion. They were really delicious, but I had to gobble dinner down so fast that the enjoyment was lost in the tummy ache that followed. Ugh. Stay tuned in for the delicious homemade Tzatkiki Sauce recipe that will be up later this week. You may notice that I used baby potatoes in this stew. I usually just peel and chop regular potatoes, but i had these on hand and it was super easy because I didn’t even peel them. Wash and add. It’s my day off today and I decided to make one of my favourite stew recipes. It was given to me several years ago by, Pat, a great family friend and my spiritual Mama! She was one of my mom’s closest friends and has always been there for me since my mom passed away over 15 years ago. I love this recipe because it is quite different from the traditional brown stew my mom served when we were growing up. I loved my mom’s stew as well, but I was intrigued by the flavour in this tomato based stew. Place the puréed tomatoes in the bottom of a roaster. Put the stewing beef on top and stir to cover. Add salt and pepper to taste. Stir. Cover the roaster and cook for 2 hours, stirring occasionally. Dissolve the bouillon mix in 1 cup of boiling water. Place a colander into a large bowl. Drain the juice into this bowl; add the sugar and beef bouillon mix to the juices. Taste and adjust the seasonings, if necessary. Set the drained meat and veggies to the side. Make a roux with the flour and melted butter in another pot. Slowly add the juice. Cook and stir until you have a nice gravy. Add the vegetables and meat into the gravy mixture. Stir and serve. I love this recipe and wouldn’t adjust a thing. However, I did come across a similar recipe one time that included BBQ sauce. I decided to mix it in with the tomatoes and it was a nice addition, so I included it as an option. Either way is delicious! Dumplings are the selling feature in my family. My kids absolutely love them and they are pretty easy to make. My recipe comes from my Grade 7 Home Economics cookbook “Recipes for Young Adults”. I have to say, I still use several recipes from that book. We had company a few weeks back and decided to try this recipe from Divas Can Cook. I’ve had great success with Monique’s recipes and this was no exception. 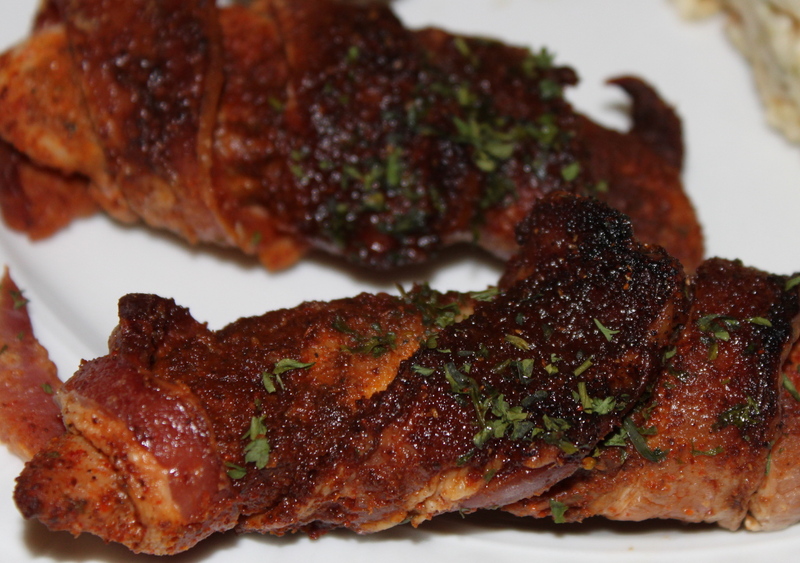 This is actually super easy to make, but looks like lots of work with the bacon wrapped around it. Mix the salt, paprika, black pepper, onion powder,italian seasoning, and garlic powder in a small bowl. Sprinkle the spice mixture evenly over both sides of the chicken tenders, completely coating them with the spices. Wrap two sliced bacon strips around the chicken tender. Tuck in the loose ends. I didn’t worry about putting a toothpick or anything in, once cooked they seemed to stay. Mix together brown sugar and chili powder. Sprinkle this mixture generously over bacon wrapped chicken, top and bottom. Press the sugar mixture into the chicken to pack it on. Place the chicken on a greased grill pan. Bake for 25-30 minutes or until chicken is done and bacon is crisp. You can broil for the last few minutes if desired to crisp up the bacon more. I think this would be excellent cooked on the barbecue as well. Can’t wait to try it on the grill. I was also thinking that I might like to substitute the Brown Sugar and Chili Powder Mixture for the topping used in the Island Pork Tenderloin Recipe I shared some time ago. In this recipe, you mix the following three ingredients together and then apply in the same way as this recipe suggests. I would love to try this combination in lieu of the original just to see what it’s like. I absolutely love this on pork tenderloin.